This chapter introduces the focus of the book, highlighting developments in genocide scholarship and noting the lack of research relating to the life after genocide. 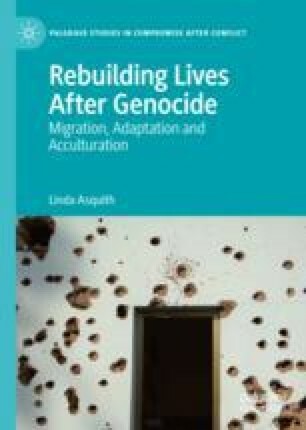 The chapter highlights and contextualises the key ideas that will be discussed throughout the book, and introduces the idea of ‘Life After Genocide’. In particular, this chapter makes an argument for an increased sociological focus on genocide to highlight the broader cultural processes around the management of trauma. In doing so, the chapter introduces the ideas of Bourdieu in relation to social capital and explains why Bourdieu’s ideas are particularly useful in understanding how people recover from genocide. Alongside this, the chapter explains what ‘genocide’ is, providing a summary of the legal definition and an explanation of how the term was defined by Raphael Lemkin. The chapter concludes by providing a discussion of the term ‘victim’ and a summary of the structure of the book. Amnesty International. (1997). The Quest for International Justice: Defining the Crimes and Defences for the International Criminal Court. Report [online]. Retrieved December 1, 2018, from https://www.amnesty.org/download/Documents/164000/ior400061997en.pdf. Gourevitch, P. (2014). Remembering in Rwanda. The New Yorker, April 21. Retrieved December 27, 2018, from https://www.newyorker.com/magazine/2014/04/21/remembering-in-rwanda. Stanton, G. (2019). 10 Stages of Genocide. Retrieved January 2, 2019, from http://genocidewatch.org/genocide/tenstagesofgenocide.html. UN. (1993). UN Security Council Report of the Secretary General. Retrieved May 27, 2013, from http://www.icty.org/x/file/LegalLibrary/Statute/statute_re808_1993_en.pdf. United to End Genocide. (2018). South Sudan. Retrieved December 12, 2018, from http://endgenocide.org/conflict-areas/south-sudan/.